Two years ago, gas cost almost $4.00/gallon and I had just started commuting over 70 miles a day to work, 5 days a week. This was in addition to about 200 miles in family trips and errands that we put on the car each month. The 2012 Mazda 5 that we owned at the time got about 24 MPG and we were paying more than $280 just for gas each month. Something needed to change! My wife and I started shopping for more fuel efficient vehicles and decided to look into whether or not an electric car might be a smart move us. We decided to take the plunge into all electric driving with a Ford Focus Electric and immediately started saving around $227/month - in fuel costs alone. The funny part is that our monthly payment for the car itself also went down from $333 to $308. It was weird to get a brand new $41,000 car (Ford Focus Electric) that cost less each month than the $25,000 car (Mazda 5) we had purchased two years prior. On top of that, we no longer needed oil changes at $50 a pop every 3 or 4 months (the Mazda 5 called for a more expensive fully synthetic oil) . 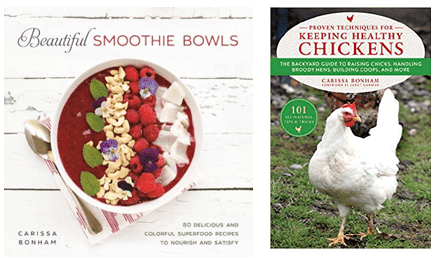 In total, it eased our monthly budget by around $270. With a $308 lease payment minus the total cost savings of $269, it was like having a car for $39/month! WOW. Wait! Hold the phone! Why is our monthly payment for a $41,000 car lower than the payment for a $25,000 car? That is the magic of the Federal tax credit combined with a lease. When you lease, you only pay for a portion of the car's total value, typically three years worth. In this case, after $5,251 of manufacturer incentives this came down to $18,280. Even better, in a lease the manufacturer gets the entire $7,500 credit and they roll it back into the lease thereby lowering the cost of your monthly payments. For us and our Ford Focus Electric, that meant that the $18,280 three-year lease ($522/month) was reduced to $10,780 or just $308/month thanks to the federal tax credit. Even better, if we still love the car at the end of the leasing term, we won't lose what we paid since we have the option of purchasing its remaining value for $17,480. It's true. Almost two years later, gas is a lot cheaper (I also commute less). One might think that our cost savings evaporated. But even with gas being only $2.75/gal and having a shorter 50 mile commute, we still save about $137/month compared to our old gas powered car. This made me wonder: How cheap would gas have to get to cancel out the savings of an EV? So I did the math, and there turned out to be a definitive line in the sand. Gas would have to drop to 55 cents/gallon just to be competitive and break even (not counting our finance payment savings). This factors in both fuel savings and oil change savings. The price of gas hasn't been that low since 1974. No matter how optimistic you are about the dropping price of oil, I don't think a single economist is expecting to see those numbers at the gas station again. This means that every family will save between $70 to $251 per month depending on how many miles you drive and how the cost of gas fluctuates. This is why the drop in gas prices has not affected plug-in car sales like some might expect. Even with all this math, two years ago I was still not sold. I was raised with the notion that the cheapest car to own is the one you have right now. We were already vested and were actually underwater in our Mazda 5. To help me make a more logical decision, I made a spreadsheet that factored in yearly depreciation, how many more car payments we had left and the estimated market value of the Mazda 5 when it was paid off. All this I projected out 5 years. The EV still saved us a few thousand dollars in the end. That’s when I knew. There was no logical reason to hold on to our gas car. There were financial benefits in the short term and in the long term. The only reasons to not move forward were purely emotional. The chart below is a quick way for you to estimate how much you might save each month by switching to an EV. It assumes the fuel efficiency of your current gas car is 24 miles/gal. If it is worse, your savings will be even more. On the left, find the row that matches how much gas costs near you (or what it might change to), and jump across to the column that represents how many miles you drive a month. There are lots of factors in play here, but it will be a close estimate. I'd love to hear from you! 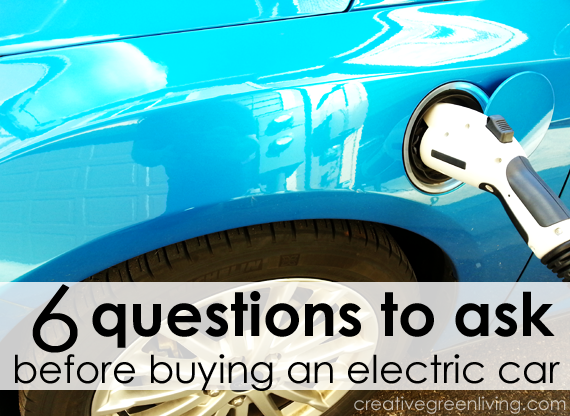 How much money do you think you could save each month by switching to an all-electric vehicle? Have you ever thought about switching to an electric car to save money? Need help with next steps? Please ask. I'm here to help! 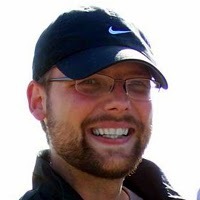 Joe describes himself as a skeptical researcher and a hesitant convert to an eco-friendly lifestyle. An accidental electric car enthusiast, Joe has fallen in love with both the money-saving and planet-saving powers of electric vehicles and wants to empower as many families as possible to make the switch to electric car technology. Interested in having Joe test drive your electric car or write about your brand? Contact us here. Our family has had our Electric Vehicle (EV) for almost two years. It has over 30K miles and is the only car our family of two adults, two kids and two dogs has (we drive a Ford Focus Electric, in case you’re wondering). If you’re in the market for a fuel efficient car or looking for something that gets the best MPG’s, make sure you check out electric cars in your search for your next vehicle. Can its “cold weather” range get me to and from work? EVs excel as commuter vehicles. They are quiet, accelerate well, and save lots of money on fuel and maintenance. 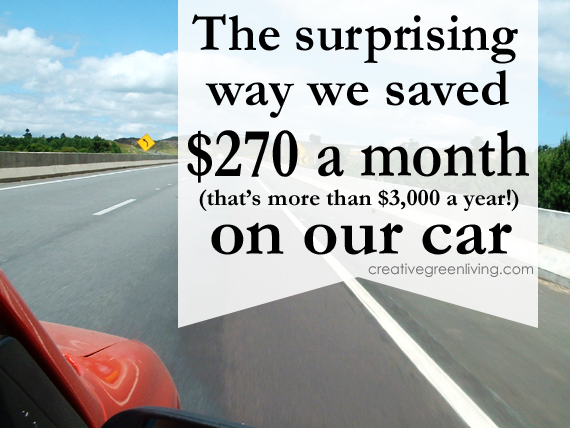 When we got ours, we immediately started saving $260 in just commuting gas costs. Just don’t base your decision on its mild weather range. For example, I commute 25 miles each way to work - 50 miles total. In the summer, the Ford Focus Electric’s (FFE) 76 mile range is even higher, closer to 80-85 miles. The FFE handles my 50 mile commute in stride and even allows for an out of the way errand on the way home. But in the winter with the defroster on, I’m limited to 50-55 miles and pretty much have to come straight home. I used to work 35 miles away. During the summer, this was a non-issue. In the dead of winter, though, I had to “trickle charge” on a standard (120 volt) electric outlet on the outside of the building at work to top it off. If your commute is pushing the boundaries for your car's range, check out Plug Share, an EV charging station map (it has a smart phone app, too) to see if there is a charge nearby or check out the building you work at. Your manager might not mind letting you plug into the standard outlet that's on the side of the building or in the parking garage. How often will I need a back up traditional gas vehicle? Those who already own a gas-powered car as a second vehicle won’t need to worry about this. Although, if you can afford a Tesla Model S, you won't need to worry about it then, either. If you're looking at going all-electric for your family's only vehicle, you'll need to be more like us. Since we were going all-electric for our only car, we had to consider carefully. Our minimum criteria was that we wanted to be able to make it to the airport and back (a 71 mile trip) without charging or renting a car. We also visit my wife’s parent about once a month - a 50 minute drive away. Both are very doable with our 76 mile average range. It’s even doable in the winter because we have become just that skilled in our driving habits. Not only is it doable, but we know that there are charging stations at the airport if necessary, and an outlet in my father-in-law’s garage. People often write off the possibility of an electric car due to "lack of infrastructure." In reality, there are electrical outlets everywhere! Every house, every business, usually has an outlet of some kind somewhere. Remember, etiquette is to ask before plugging in and offer to compensate for electricity used. That left us with needing to rent a car about four times a year for longer trips. Renting for longer trips is nice because all those miles go on a rental rather than your bread-n-butter vehicle (if you have a limit to how many miles you can use on your lease, this is a bigger deal). The way we calculate, the money saved on oil changes alone pays for the few times a year we need a rental car. Now, if your EV has DC quick charging, you could go on a longer trip up or down a major highway and charge your battery to about 80% capacity in 20 minutes. Ours does not. The truth is, we didn’t need it and loved the car so much that we didn't let it hold us back. But we certainly want it in our next EV mostly because its a nice perk. Will it fit our family? Trips to Ikea, and Christmas trees we handle soundly with a roof rack. No problems there. The real issue is internal storage. If you have small kids, I recommend bringing the family stroller with you to the dealership to see if it fits. Our first mammoth stroller would not, but our current stroller: a Bumbleride Indie 4 does fine- even with the reduced trunk space in the Electric version of the Ford Focus. 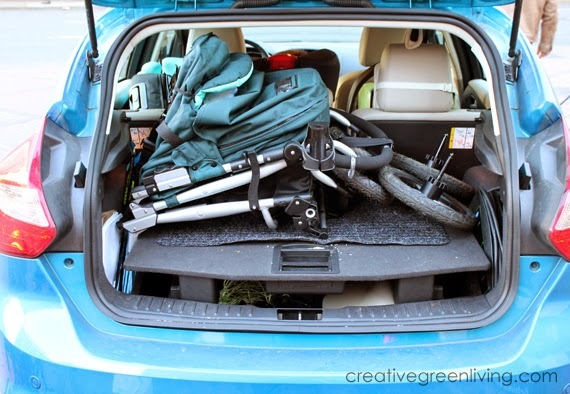 Just one more reason to love our Bumbleride Indie 4 stroller: It fits in the trunk with room to spare. The Leaf would have even more room. We are Costco members and routinely bring both our children, both of us, and fill the shopping cart with groceries. We can fit everything and everyone in the car with no problem. If we were to have a third kid, though, that would be tough, unless one of them were big enough to no longer need a car seat. Now, we have fit three children in the car, all correctly fastened in their car seats - but to be honest it's a huge pain and not something we would want to do every day. Most sedans/hatchbacks are going to be the same. I wish Ford would make a plug-in version of its spacious Edge. By the time our kids are both long legged teenagers, we will have outgrown our FFE, but that's still 10 years away. We are hoping for a plug-in SUV in our price range to be available ASAP as our family’s needs slowly change and grow. In this unique situation - for a few more years at least, I recommend leasing your electric car for three reasons. There is a DC quick charge format war, Chademo vs Combo vs Tesla Super Charger. Remember when Blu-ray and HD DVD were competing to be the standard? Yeah, exactly. Technology is changing fast. If there is a bigger battery in just a few years, you may want to trade out without risking the extra depreciation. If you purchase outright, you will not get your federal incentive ($7500) until your next tax return - and only as long as you get taxed at least that much each year. But if you lease, the credit is rolled into the lease (although only part of it in the case of the Chevy Volt). If you still want to keep the car at the end of the lease, just purchase it at its used price. Eventually that tax credit will be done, but for now you can drive an EV for the price you would normally pay in gas each month. Do I have to get a home charging station (EVSE)? No, but most people will want one. You’ll need at least a normal electrical outlet near your parking space. Apartments and condos may have issues here. We went a full six months “trickle charging” each night on a normal 120 volt outlet in our garage (at the rate of about ~4 miles/hour). The reason we upgraded to a level 2 EVSE (240 volt outlet) was to guarantee a full battery by morning if we got back home after midnight. The other issue we ran into was when we needed to rapidly charge (at a rate of about ~17 miles/hour or 4.8 kWh) between morning errands and afternoon errands. There are lots of fancy cords and stations on the market upwards of $2000. We got ours from Clipper Creek for just $550. It just plugs into a clothes dryer style outlet. The only installation required was to install the 240 volt outlet next to our electrical panel (which cost less than $100). The only thing I would have done differently is to get this version so we could take it with us and plug in at RV sites across the country. If I am keeping the EV long term, am I financially prepared to replace the battery? There are no oil changes, no gears to switch in the transmission, and the brakes are used less due to regenerative braking. Be wise. Save this maintenance money for the big unknown: the longevity of the battery. This isn’t really an unknown, since there are pioneers in this area with concrete data. If you are going to keep your EV long term (for 100,000 miles or more) you have to purchase it knowing that eventually it may need a new battery. Now, if 80% capacity is still good for you 100,000 miles later - and depending on your driving habits, it just might be- you may not have to spend the money. Nissan is the first company to publish replacement cost for its battery, $5499 plus labor. While prices are expected to come down over the next few years, batteries also will be getting bigger. A half price battery that’s double the size may still cost $6K and up. For us, it is worth it and we went in emotionally prepared for the commitment. 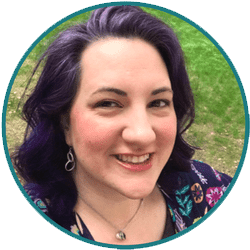 As the newest member of the Creative Green Living team, I'm excited to talk more about electric cars with you. If you have a general question about electric cars, my personal experience with our Ford Focus Electric or are considering purchasing an electric car, please ask a question in the comments. I'll be sure to answer, and if the answer is long enough, I might even make your question the topic of my next article!